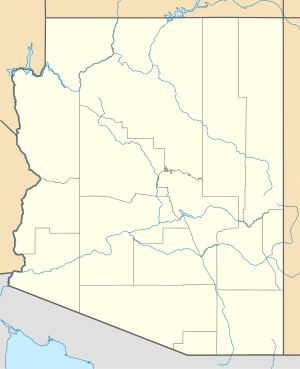 Davis–Monthan Air Force Base (DM AFB) (IATA: DMA, ICAO: KDMA, FAA LID: DMA) is a United States Air Force base 5 miles (4.3 nmi; 8.0 km) south-southeast of downtown Tucson, Arizona. It was established in 1925 as Davis-Monthan Landing Field. The host unit for Davis–Monthan AFB is the 355th Wing (355 WG) assigned to Twelfth Air Force (12AF), part of Air Combat Command (ACC). The base is best known as the location of the Air Force Materiel Command's 309th Aerospace Maintenance and Regeneration Group (309 AMARG), the aircraft boneyard for all excess military and U.S. government aircraft and aerospace vehicles. Davis–Monthan Air Force Base is a key ACC installation. The 355th Wing (355 WG) provides A-10 Thunderbolt II close air support and OA-10 forward air controllers to ground forces worldwide. The 355 FW is also the host unit, providing medical, logistical, mission and operational support to all assigned units. The 355 FW is also the sole formal training unit for the A-10 aircraft, providing initial and recurrent training to all U.S. Air Force A-10 and OA-10 pilots, to include those in the Air Force Reserve Command (AFRC) and the Air National Guard (ANG). The 355th is also ACC's executive agent for INF and START treaty compliance. One of the wing's tenant units, the 55th Electronic Combat Group (55 ECG), is a geographically separated unit (GSU) of the 55th Wing (55 WG) at Offutt AFB, Nebraska and is an ACC unit tasked to provide offensive counter-information and electronic attack capabilities in support of U.S. and Coalition tactical air, surface, and special operations forces with its Lockheed EC-130H Compass Call aircraft and employing the EC-130H in tactical air operations in war and other contingencies worldwide. The 55 ECG also provides initial and recurrent training to all EC-130H Compass Call pilots, navigators and air crew. Two other major tenants, the 563rd Rescue Group (structured as a GSU under ACC's 23d Wing at Moody Air Force Base, Georgia), and the Air Force Reserve Command's (AFRC) 943rd Rescue Group (structured as a GSU under AFRC's 920th Rescue Wing at Patrick Air Force Base, Florida), are tasked to provide combat search and rescue (CSAR) and personnel recovery (PR) support worldwide. Perhaps the most prominent tenant is the 309th Aerospace Maintenance and Regeneration Group (309 AMARG) of the Air Force Material Command (AFMC). As the main location for the 309 AMARG, Davis–Monthan AFB is the sole aircraft boneyard for excess military and U.S. government aircraft and other aerospace vehicles such as ballistic missiles. Tucson's dry climate and alkali soil made it an ideal location for aircraft storage and preservation. The 355 OG consists of six squadrons and over 450 personnel employing A-10 aircraft and an AN/TPS-75 radar system. It provides war-fighters with forces for close air support (CAS), air interdiction (AI), forward air control (FAC), combat search and rescue (CSAR), ground-based tactical air control, and airbase operations. It also conducts all formal course directed aircraft initial qualification/ re-qualification training. All active duty aircraft assigned to Davis–Monthan Air Force Base carry the tail code "DM". 355th Mission Support Group (355 MSG) - The 355 MSG consists of about 2,000 military and civilian personnel in six diverse squadrons that train, equip and provide agile combat mission support, including civil engineering, communications, contracting, transportation, fuels, supply, deployment readiness, personnel, security forces, and services for immediate worldwide deployment of combat support elements. The group also provides an effective in-garrison support infrastructure and quality of life services for 26 wing and 32 associate units spanning a 60,000-person, 10,763 acres (43.56 km2) community, one of the largest in Air Combat Command. 355th Maintenance Group (355 MXG) - The 355 MXG supports eight flying squadrons, providing organizational and intermediate field level/back shop maintenance for 110 A-10C, and intermediate field level/back shop maintenance for an additional 14 EC-130H, 1 TC-130H, 8 HH-60H, and 6 HC-130J combat-ready aircraft. The 355 MXG has over 1,700 assigned personnel, ensures quality of on- and off-equipment aircraft maintenance, and executes an annual O&M budget of $72.2M. 355th Medical Group (355 MDG) - The 355th Medical Group was established in 1955 as the 355th USAF Infirmary at McGhee Tyson AFB, Tennessee. After several redesignations, it was activated at Davis-Monthan AFB as the 355th Medical Group in 1992. The 355th Medical Group ensures combat medical readiness of all operational and support units home-based at Davis-Monthan AFB for global contingencies. With an authorized staff of 407 and a resource allocation totaling $26 million, the 355 MDG ensures that warriors at Davis-Monthan AFB are medically fit-to-fight. In addition to training and equipping/manning 25 mobility teams, the 355 MDG also promotes the health and wellness of the Davis-Monthan AFB community by meeting the health care needs of over 54,000 eligible DoD beneficiaries in southern Arizona. Between October 2013 and March 2014, the 924 FG transitioned from being a "classic" associate unit when it gained 28 A-10 aircraft of its own from Barksdale AFB, Louisiana. The 924th is now part of the Total Force Enterprise, and is the only unit-equipped both active and classic associate fighter group in Air Force Reserve Command's inventory. With oversight of the 47th Fighter Squadron, 924th MS, and 924th OSF, the group is charged with working with the Regular Air Force's 355th Fighter Wing to functionally integrate with the 355th Operations Group and 355th Maintenance Group to conduct A-10 pilot training at Davis-Monthan AFB. 309th Aerospace Maintenance and Regeneration Group (AMARG), (Air Force Materiel Command) - This group is responsible for the base's aircraft "graveyard", the largest in terms of number of planes in the world, where old military and other aircraft are stationed either to be stored indefinitely, demilitarized for museum or monument display, stripped and pulped/recycled, or restored for service. Other military activities and federal agencies using the base include the Navy Operational Support Center Tucson, a detachment of the Naval Air Systems Command, the Federal Aviation Administration, the U.S. Customs and Border Protection Air and Marine Operations Tucson Air Branch, and the U.S. Army Corps of Engineers. Also located on base is the 25th Operational Weather Squadron 25 OWS. The squadron produces forecasts for the Western United States and is part of the 1st Weather Group (1 WXG) headquartered at Offutt Air Force Base, Neb. The squadron also serves as a training hub for new weather professionals - both enlisted and officers. The base provides additional active duty support to the 162d Fighter Wing (162 FW) of the Arizona Air National Guard and the Air National Guard Air Force Reserve Command Test Center, both located at Tucson Air National Guard Base at nearby Tucson International Airport, and both of which fly the F-16C and F-16D Fighting Falcon, with the latter also operating an A-10 Thunderbolt II detachment in concert with the 355 FW at Davis-Monthan AFB. The base was named in honor of World War I pilots Lieutenants Samuel H. Davis (1896–1921) and Oscar Monthan (1885–1924), both Tucson natives. Davis, who attended the University of Arizona prior to enlisting in the Army in 1917, died in a Florida aircraft accident in 1921. Monthan enlisted in the Army as a private in 1917, was commissioned as a ground officer in 1918, and later became a pilot; he was killed in the crash of a Martin B2 bomber in Hawaii in 1924. In 1919, the Tucson Chamber of Commerce aviation committee established the nation's first municipally owned airfield at the current site of the Tucson Rodeo Grounds. The rapid increase in aviation activities meant a move in 1927 to the site which is now Davis–Monthan Air Force Base. After the City of Tucson acquired land southeast of town for a runway in 1925, Charles Lindbergh, fresh from his nonstop crossing of the Atlantic Ocean, flew his "Spirit of St. Louis" to Tucson in 1927 to dedicate Davis-Monthan Field, then the largest municipal airport in the United States. Military presence at the field began when Sergeant Simpson relocated his fuel and service operation to the site on 6 October 1927. He kept a log containing names of the field's customers, including Lindbergh, Amelia Earhart, Benjamin Foulois, and Jimmy Doolittle. Doolittle, awarded the Medal of Honor for his 1942 Tokyo raid, was the first military customer at the field on 9 October 1927. The combination of civil and military operations worked well until the early 1940s, when military requirements began to require the relocation of civil aviation activities. Davis-Monthan Airport became Tucson Army Air Field in 1940, as the United States prepared for World War II. The first assigned U.S. Army Air Corps units were the 1st Bomb Wing, 41st Bomb Group and 31st Air Base Group, activating on 30 April 1941 with Lieutenant Colonel Ames S. Albro Sr. as commanding officer. In its military role, the base became known as Davis-Monthan Army Air Field on 3 December 1941. U.S. Army Air Forces leaders then utilized the airfield for heavy bomber operation, sending Douglas B-18 Bolo, Consolidated B-24 Liberator, and Boeing B-29 Superfortress bombers, for training and observation missions. Training at the airfield came to a halt on 14 August 1945, when the Japanese surrendered. Davis-Monthan played a post-war role by housing German POW's from June 1945 to March 1946. It also served as a separation center, which brought the base populace to a high of 11,614 people in September 1945. With the end of the war, operations at the base came to a virtual standstill. It was then when the base was selected as a storage site for hundreds of decommissioned aircraft, with the activation of the 4105th Army Air Force Unit. The 4105th oversaw the storage of excess B-29s and C-47 "Gooney Birds." Tucson's low humidity and alkali soil made it an ideal location for aircraft storage and preservation, awaiting cannibalization or possible reuse — a mission that has continued to this day. The Cold War era was ushered in at Davis-Monthan on 21 March 1946, with the installation placed under the claimancy of the recently established Strategic Air Command (SAC). SAC's presence at the base began in the form of the 40th and 444th Bombardment Groups, both equipped with B-29s. As part of the postwar austerity, these groups were later inactivated, with the personnel and equipment being consolidated into the 43d Bombardment Group in October. On 11 January 1948, with the establishment of the United States Air Force as independent service four months earlier, the facility was renamed Davis–Monthan Air Force Base. On 30 June 1948, the Air Force activated the 43rd Air Refueling Squadron, whose KB-29Ms were newly equipped with aerial refueling equipment purchased from the British firm FRL. The 43rd ARS, along with the 509th ARS at Walker AFB, New Mexico, was the first dedicated air refueling unit in history. On 2 March 1949, the Lucky Lady II, a B-50A of the 43d Bombardment Wing, completed the first nonstop round-the-world flight, having covered 23,452 miles (37,742 km) in 94 hours and 1 minute (249.45 mph). Lucky Lady II was refueled four times in the air by KB-29 tankers of the 43d Air Refueling Squadron, which had made only one operational air refueling contact before the mission. For this outstanding flight, the Lucky Lady II's crew received the Mackay Trophy, given annually by the National Aeronautic Association for the outstanding flight of the year, and the Air Age Trophy, an Air Force Association award, given each year in recognition of significant contributions to the public understanding of the air age. In 1953, the jet age came to Davis-Monthan when SAC units on the base converted to the new Boeing B-47 Stratojet. The 303d Bombardment Wing, Medium, was initially established on 27 August 1951, and activated at Davis-Monthan AFB on 4 September 1951. The wing operated B-29s until January 1952, when it was equipped with KB-29s. On 20 January 1953, the 303d transitioned to the Boeing B-47 Stratojet for its three bomb squadrons, while an additional air refueling squadron equipped with KC-97s was assigned to the wing between 18 February 1953, and 1 February 1956. A standard SAC Alert Area ramp was constructed in the southeast corner of the base adjacent to the runway and the 303d assumed nuclear alert responsibilities when final conversion and checkout in the B-47 was complete. In April 1953, the Air Defense Command's (ADC) 15th Fighter-Interceptor Squadron was activated with F-86A Sabres. A year later, the unit transitioned into F-86Ds followed by a transition to F-86Ls in the fall of 1957. In the spring of 1959 the unit received Northrop F-89J interceptors which it flew for only a year when it transitioned into McDonnell F-101Bs. On 24 December 1964, the 15th FIS was inactivated. In 1962, the Strategic Air Command's 390th Strategic Missile Wing (390 SMW) and its 18 Titan II ICBM sites around Tucson were activated. The 390 SMW was one of only three Titan II missile wings in SAC and represented the heaviest land-based missile and the largest single warhead ever fielded by U.S. strategic deterrent forces. In July 1963, the 4028th Strategic Reconnaissance Weather Wing, equipped with U-2 strategic reconnaissance aircraft, began flying global missions from Davis-Monthan. Following the Cuban Missile Crisis in 1963, the 4080th Strategic Reconnaissance Wing at Laughlin AFB, Texas, relocated to the base and assumed responsibility for all U-2 operations, emphasizing long-range strategic reconnaissance and intelligence collection. As a Strategic Air Command (SAC) unit, the 4080th was later redesignated the 100th Strategic Reconnaissance Wing and also acquired Lockheed DC-130 Hercules aircraft for launch and control of Firebee reconnaissance drones that were the precursors of contemporary unmanned aerial systems. The DC-130s and U-2s remained at the Davis-Monthan until 1976, when the 100 SRW was inactivated, its DC-130s transferred to Tactical Air Command's 432d Tactical Drone Group, and its U-2s transferred to SAC's 9th Strategic Reconnaissance Wing (9 SRW) at Beale Air Force Base, California, where U-2 Dragon Lady operations were consolidated with SR-71 Blackbird operations. On 15 June 1964, Davis-Monthan's 303d Bombardment Wing was inactivated as part of the retirement of the B-47 Stratojet from active service. The year 1964 brought back the combat crew training mission of the World War II years with the 4453d Combat Crew Training Wing of the Tactical Air Command equipped with the Air Force's newest and most sophisticated fighter, the McDonnell Douglas F-4 Phantom II. In July 1971, the 355th Tactical Fighter Wing, flying the A-7 Corsair II aircraft, was activated at the base and the previously assigned F-4s were moved to Luke AFB, near Phoenix, Arizona. The 1980s brought several diverse missions to D-M. The headquarters charged with overseeing them was now the 836th Air Division, which was activated 1 January 1981. The AD advised Air Force component commanders and land forces on A-10 aircraft tactics, training, employment and readiness, and subordinate units participated in exercises such as Red Flag and Celtic Echo. The 41st Electronic Combat Squadron equipped with the EC-130H Compass Call aircraft, arrived on 1 July 1980, and reported to the 552d Airborne Warning and Control Wing. In 1981 D-M welcomed the 868th Tactical Missile Training Group (866 TMTG). The 868th was the only U.S.-based Ground Launched Cruise Missile (GLCM) unit and the source of the crews that staffed the forward deployed GLCM wings in NATO in 1982. On 1 September 1982, the headquarters of the 602d Tactical Air Control Wing (TAIRCW) and its subordinate 23rd Tactical Air Support Squadron (TASS), a unit responsible for the Air Force's tactical air control system west of the Mississippi River transferred from Bergstrom Air Force Base, Texas, and stood up at D-M, bringing 16 OA-37B aircraft and numerous new personnel to the base. The 23rd TASS became the Air Force's first O/A-10 squadron in 1988, providing heavily armed airborne forward air control (FAC) capability for the first time. Unlike all other D-M aircraft at the time, the 23rd TASS fleet's tail flash read "NF", for "Nail FAC"; the squadron's radio call sign was "Nail." In 1984, as a result of the first series of Strategic Arms Reduction Treaties START I between the United States and the Soviet Union, SAC began to decommission its Titan II missile system. In 1982, the 390 SMW began removing its 18 missiles and inactivating the associated sites in preparation for eventual demolition. In October 1981, President Ronald Reagan announced that, as part of the strategic modernization program, Titan II systems were to be retired by 1 October 1987. 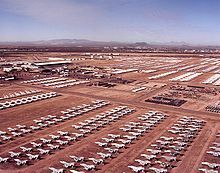 Deactivation began at Davis-Monthan on 1 October 1982. During the operation, titled "Rivet Cap", the missiles were removed and shipped to Norton AFB, California for refurbishment and storage. Explosive demolition began at the headworks of missile complex 570-7 on 30 November 1983. In May 1984, the 390 SMW's last Titan II at Davis-Monthan came off alert status. SAC subsequently inactivated the 390th Strategic Missile Wing on 30 June 1984. One site under the 390 SMW, known both as Titan II Site 571-7 and as Air Force Facility Missile Site 8, was initially decommissioned in 1982. Located approximately 12 miles (19 km) south of Tucson in Sahuarita, Arizona, it was saved from demolition and turned over to the Arizona Aerospace Foundation, a nonprofit organization which also administers the Pima Air and Space Museum immediately south of Davis-Monthan AFB. With a variety of items on loan from the National Museum of the United States Air Force, including an inert Titan II missile, Site 571-7 is now known as the Titan Missile Museum and is one of two remaining examples of a Titan II missile site in existence (the other being located at Vandenberg Air Force Base, California; site 395-C). In 1994, the site was declared a National Historic Landmark. In the 1990s, the 355 TTW continued to train A-10 crews for assignments to units in the United States, England, and Korea. During this period, the 602nd Tactical Air Control Wing deployed Airborne Forward Air Controllers in their OA-10 aircraft to Operation Desert Storm, providing nearly 100 percent of this capability to the war. On 1 October 1991, the 355 TTW was redesignated as the 355th Fighter Wing (355 FW) in tune with the Air Force's Objective Wing philosophy. The 355th Fighter Wing was composed of the 355th Operations Group (355 OG), the 355th Maintenance Group (355 MG), the 355th Medical Group (355 MDG), and the 355th Mission Support Group (355 MSG). In May 1992, the 41st and 43d Electronic Combat Squadrons, flying EC-130E Hercules Compass Call arrived. The aircraft carried an airborne battlefield command and control center capsule that provides continuous control of tactical air operations in the forward battle area and behind enemy lines. This capability added yet more strength to the wing's combat capability. The 43rd Electronic Combat Squadron "Bats" are part of the 55th Wing at Offut AFB, Nebraska, but operate out of Davis-Monthan. In addition, the 42d Airborne Command and Control Squadron arrived from Keesler AFB, Mississippi on 19 July 1994. On 1 May 1992, senior Air Force leaders implemented the policy of one base, one wing, one boss. The 836 AD and 602 TAIRCW inactivated (the later on 15 June 1992) while the 41 ECS and 43 ECS came under control of the 355 FW. With the mission diversified, the 355th Fighter Wing was redesignated as the 355th Wing (355 WG). On 1 June 1992, Tactical Air Command was inactivated and all aircraft, personnel and installations previously under TAC were transferred to the newly established Air Combat Command (ACC) on the same date. Following Operation Desert Storm, the 355 WG supported Operation Southern Watch during deployments to Al Jaber, Kuwait, in 1997 by deploying 24 A-10s, in 1998 by deploying 16 A-10s, and in 1999 by deploying 14 A-10s—all to ensure compliance of the 33rd parallel southern no-fly zone. The flight and mysterious crash of Captain Craig D. Button took off from Davis–Monthan Air Force Base on 12 April 1997. The attacks on 11 September 2001, led to the initiation of three ongoing missions: Operation Enduring Freedom (OEF), Operation Iraqi Freedom (OIF), and Operation Noble Eagle (ONE). After Operation Enduring Freedom, eight A-10s from the 355 WG were called to Bagram Airfield, Afghanistan, to fly close air support missions supporting multinational ground forces. In September 2002, the 48th, 55th, and the 79th Rescue Squadron's (RQS) transferred under control of the 355 WG, equipped with HC-130 aircraft and HH-60 helicopters. At the same time, the 41st and 43d Electronic Combat Squadrons were realigned under the control of the 55th Electronic Combat Group (55 ECG). While personnel and aircraft remained on Davis-Monthan AFB, operational control of the 55 ECG was assumed by the 55th Wing at Offutt AFB, Nebraska. Another major wing realignment occurred on 1 October 2003, with the activation of the 563rd Rescue Group (563 RQG) on Davis-Monthan AFB. Control of the 48th, 55th, and 79th Rescue Squadrons (RQS) was passed to the new group with the 23rd Wing (23 WG) at Moody Air Force Base, Georgia assuming operational command of the unit. In 2003 and 2005, the 354th Fighter Squadron (354 FS) "Bulldogs" deployed on five-month deployments to Bagram Airfield in Afghanistan. During these deployments, they provided 24-hour presence to reassure the Afghan population as it struggled with its emergent democracy, and provided key support during national elections. While the 2003 deployment saw limited action, the Bulldogs employed over 22,000 rounds of 30 mm during 130 troops-in-contact situations during the 2005 deployment. Returning to Afghanistan in April 2007 for another six-month deployment, the 345th again provided 24-hour presence and Close Air Support expertise to coalition forces in support of Operation Enduring Freedom. During this period, insurgent activity level was the highest recorded to date in OEF. The Bulldogs employed an unprecedented number of munitions during this deployment—over 150,000 rounds of 30 mm in support of over 400 troops-in-contact situations. On 26 April 2007, the 355th Wing was redesignated as the 355th Fighter Wing (355 FW) with only A-10 fighter aircraft assigned. Also in 2007, the 214th Reconnaissance Group (214 RG), an Arizona Air National Guard unit, was activated. Today[when? ], the 355 FW is composed of four groups: the 355th Operations Group (355 OG), the 355th Maintenance Group (355 MG), the 355th Mission Support Group (355 MSG), and the 355th Medical Group (355 MDG). Along with their tenant organizations, they make up the 6,000 Airmen and 1,700 civilian personnel at Davis-Monthan AFB. Air Force One arrives at the base with President Barack Obama during a 2011 visit to Tucson. This article incorporates public domain material from the United States Government document "http://www.dm.af.mil/ Davis-Monthan Air Force Base". ^ Purner 2004, pp. 31–32. ^ "Economic Impact of Arizona's Principal Military Operations" (PDF). The Maguire Company/ESI Corporation/Arizona Department of Commerce, 2008. p. 15. Retrieved 27 December 2009. ^ Gentzen, V.J. "Experimental detection and quantitative interrogration of damage in a jointed composite structure." University of Maryland M.Sc. Thesis, June 2008. Retrieved 27 December 2009. ^ Pae, P. (15 March 2009). "As travel declines, aircraft 'boneyard' in Victorville fills up". Los Angeles Times, 15 March 2009. Retrieved 27 December 2009. ^ Leighton, David (12 November 2013). "Street Smarts: Man who built Davis-Monthan Air Force Base among oldest enlisted men ever". Arizona Daily Star. Maurer, Maurer. Air Force Combat Units Of World War II. Washington, DC: U.S. Government Printing Office 1961, Republished 1983, Office of Air Force History, ISBN 0-912799-02-1. Mueller, Robert. Air Force Bases Volume I, Active Air Force Bases Within the United States of America on 17 September 1982. Washington, DC: Office of Air Force History, 1989. Purner, J. 101 Best Aviation Attractions. New York: McGraw-Hill Professional, 2004. ISBN 0-07-142519-5. Ravenstein, Charles A. Air Force Combat Wings Lineage and Honors Histories 1947–1977. Maxwell Air Force Base, Alabama: Office of Air Force History, 1984. ISBN 0-912799-12-9. Rogers, Brian. United States Air Force Unit Designations Since 1978. Hinkley, England: Midland Publications, 2005. ISBN 1-85780-197-0. U.S. Army Golden Knights Parachute Team at the 2007 "Aerospace and Arizona Days" air show, Davis-Monthan Air Force Base. Wikimedia Commons has media related to Davis-Monthan Air Force Base. Davis-Monthan Agave Gulch FamCamp information. Col Moll was assigned to the 444th Bombardment Group and 43d Bombardment Group/Wing at D-M.
Grier, Peter (2002). "The Short, Happy Life of the Glick-Em" (PDF). Volume 85 (Issue 7). Air Force Magazine. Retrieved 5 December 2016. This page was last edited on 29 January 2019, at 00:03 (UTC).